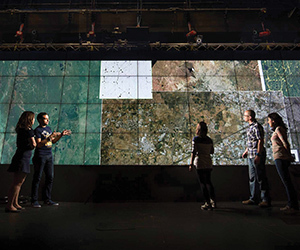 With satellite imagery and cloud-based computational platforms, Ran Goldblatt builds maps to confirm that land cover indicates urbanization, across space and time. Beginning with India, Goldblatt has built a new dataset consisting of 21,030 polygons that he manually classified as “built-up” or “not built-up,” and these categories are used for image classification and detection of urban areas. This data is then analyzed in Google Earth Engine, including also boundaries of built-up areas against the intensity of nighttime light. The goal is to geocode a database of all public and private businesses in India to analyze the relation between industrialization and urbanization. How did the global commodity boom of the 2000s affect land use and forest management around the world? Because the mines that are the source of these commodities often are in remote locations, little is known about the connection between mineral extraction and the surrounding environment. So far, the relation between mining activities and land cover dynamics has been addressed mostly through local observational analysis. In this project, GPS researchers employ a spatial and temporal lens, by collecting proprietary data on more than 30,000 mines located around the world and matching the location of these mines to high-resolution satellite imagery from the year 2000 forward. This allows a granular study of the relationship between exploration of different mining commodities and loss of forest cover worldwide, as well as the spatial distribution of global mines in relation to changes in landuse patterns, socio-economic variables and other physical attributes. Employing high-resolution satellite imagery, Kilian Heilmann, Diego Vera-Cossio and Wei You identify and measure the growth of slums around the world, caused by rapid urbanization in developing countries that pulls millions of migrants into low-quality, informal housing settlements with limited access to public services. Despite widespread study of urbanization, little is known about the extent and the growth of these vibrant urban zones. This project aims to provide researchers with consistent data on urban development over time that allow the study of slums at a global scale and the formulation of policies to alleviate poverty. David Kline and his colleagues are all eyes—via remote sensing—on what the National Oceanic and Atmospheric Administration recently declared the third large-scale coral bleaching event in recorded history. By use of satellite imagery, the team aims to replace the current, highly labor intensive monitoring practices with a mapping of shallow reefs from space. The goal is to develop tools to quantify bleaching episodes through remote sensing (i.e., satellite imagery) and then to build detection algorithms that help estimate the extent and severity of bleaching, with hopes to transform coral reef management and conservation. Using high-resolution satellite imagery and advanced big data analysis tools, Jennifer Burney is turning to the trees to gauge the health of semi-arid ecosystems, which are home to the world’s poorest populations and areas most affected by climate change. Prototyping this assessment tool in Sertão, Brazil, Burney develops tree density maps for a specified region that will then be “ground-truthed” and linked to farm-level management data. 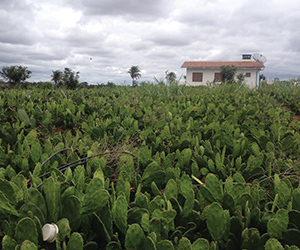 The ultimate goal is to use this novel technique across the world’s semi-arid regions to provide high-resolution indicators of overall ecosystem health, and to help identify best locations for joint productivity and conservation interventions. *Supported by the Big Pixel Initiative, a technology partnership with DigitalGlobe Foundation and Google Earth Engine made possible through funding from CGT and UC San Diego’s Qualcomm Institute. For more information, visit bigpixel.ucsd.edu.